On this episode of DTB’s “Preshow Rituals”, the country rock band, A Thousand Horses, talks about what they do before taking the stage, while on tour with Kid Rock. On this episode of DTB’s “Tour Tips (Top 5)”, the country rock band, A Thousand Horses, recommends their tips for being on tour, while on tour with Kid Rock. On this episode of DTB’s “Tour Pranks”, the country rock band, A Thousand Horses, reveals the pranks they’ve pulled on tour, while on tour with Kid Rock. A Thousand Horses is currently supporting their newest album, Bridges. On this episode of DTB’s “Tour Pranks”, Geoffrey Hill and Johnny Chops from the country band, Randy Rogers Band, reveals the pranks they’ve pulled on tour. On this episode of DTB’s “Gear Masters”, the guitarist, Geoffrey Hill (of Randy Rogers Band), shows off the gear that he uses onstage. On this episode of DTB’s “Dream Tour”, the country rock band, A Thousand Horses, discusses their ultimate tour lineup, while on tour with Kid Rock. A Thousand Horses is currently supporting their newest album, Bridges. The country rock band, Blackberry Smoke, has announced a co-headlining U.S. tour with JJ Grey & Mofro, for June and August. 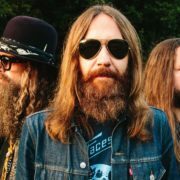 Blackberry Smoke is touring in support of their latest album, Find a Light. On this episode of DTB’s “Gear Masters”, the bassist, Johnny Chops (of Randy Rogers Band), shows off the gear that he uses onstage. Johnny Chops & the Razors is currently supporting their self-titled album.